Shocked Investor: Beware The Weekly Options: CSCO Options Expire Today. Beware The Weekly Options: CSCO Options Expire Today. 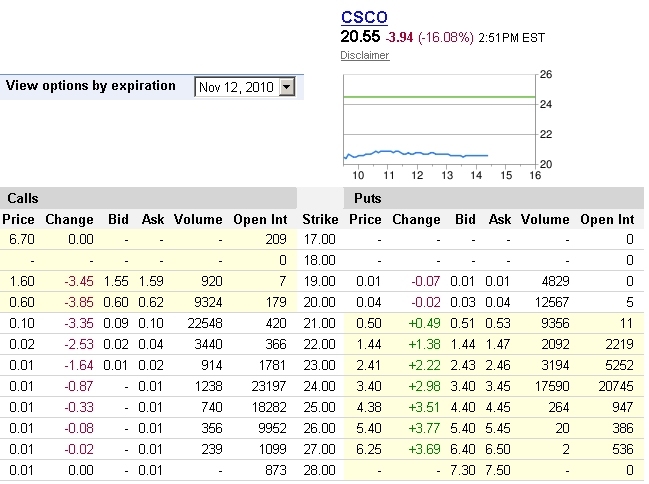 Investors poured into CSCO options today, including yours truly. However, I ended up buying options that expire today, and not next Friday as is normal. They are called weeklies. The above is from Google options chain. Note the date! Those options would expire or be exercised after the close today. If they don't sell today, a lot of investors would end up owning CSCO shares, and having to fork out significant sums. Many thanks to miadhach for saving my skin on these.